Search for shortcuts target path, working directory, arguments, and icon location content. Replace multiple shortcuts' target paths, working directories, arguments, and icon location content (useful if you move portable applications paths or directory). Search for dead links to resolve or delete them (multiple resolves/delete in one click). Alternatively, Shortcuts Search and Replace Portable is also available. How to extract: Download the ZIP package and extract to a folder of your choice. Launch ShortcutsSearchAndReplace.exe or ShortcutsSearchAndReplace64.exe. Option to only set args of some specific links. Small GUI changes (Custom Folder renamed into Search Folder). 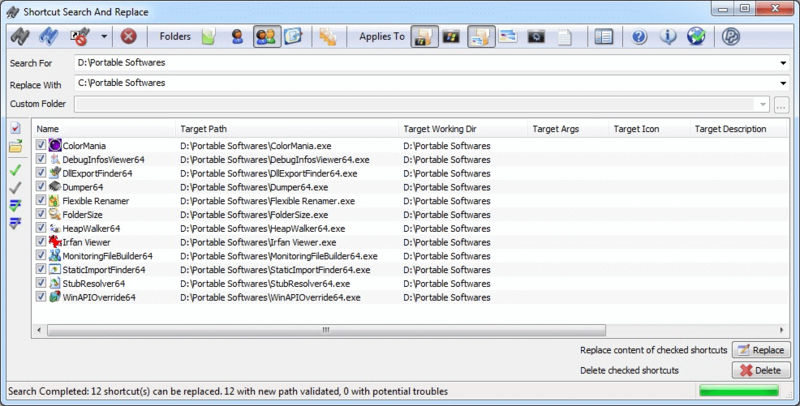 BulkFileChanger allows you to gather a list of files via drag-and-drop, explorer, or wild card searches. Users can then execute a command, change properties (time/date/hidden/read-only etc. ), export file list, or copy/move files to another location. How to extract: Download the ZIP package and extract to a folder of your choice. Launch BulkFileChanger.exe. BulkFileChanger now allows you to change the date/time values stored inside EXIF data of .jpg files. You can change 3 EXIF date/time values: Generated Time, Stored Time and Modified Time. 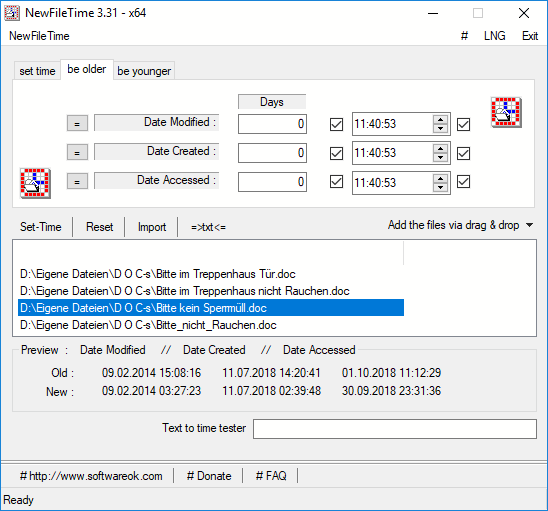 The most useful field to change is the 'Generated Time' (also known as 'Date Taken'), because this field is displayed under the 'Date' column of Windows Explorer and also many applications use this value as official date/time of the picture. This feature works only when the date/time values already exist inside the .jpg files (BulkFileChanger cannot add new fields into the EXIF data). Good simple program that can bulk shift time + or - for video files for example that has been taken in a different timezone without changing the camera time before the shots. AlternateStreamView lets you scan your NTFS drive and find all hidden alternate streams stored in the file system. After scanning and finding the alternate streams, you can extract these streams into the specified folder, delete unwanted streams, or save the streams list into text/html/csv/xml file. How to extract: Download the ZIP package and extract to a folder of your choice. Launch AlternateStreamView.exe. Fixed bug: AlternateStreamView failed to remember the last size/position of the main window if it was not located in the primary monitor. AlternateStreamView.exe /scomma "" | more. @ vmars316: Alternate (Data) Streams are a data structure for holding additional structured data within a file in addition to the main data. The Windows NTFS file system allows so-called Alternate Data Streams (ADS). With this function, data can be stored invisibly tied by the user to a file. I thought streams were small bodies of water that flow through the forest, sorry couldn't resist :) This really software really is helpful in finding and seeing data that was cleverly concealed until using this. Thanks for some helpful software another hit from Nirsoft, keep em coming please. 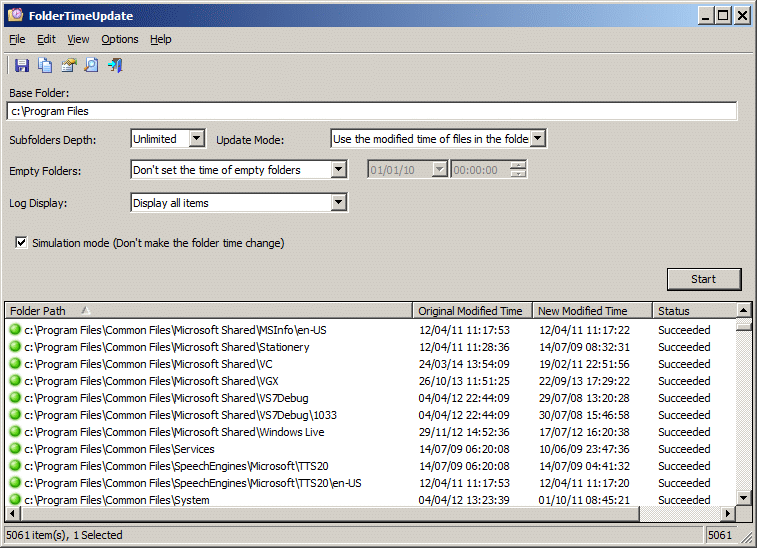 FolderTimeUpdate scans all files and folders under the base folder you choose and updates the 'Modified Time' of every folder according the latest modified time of the files stored in it. This tool might be useful if, for example, you backup a cluster of folders and then restore them into another disk, but the backup program doesn't restore the original modified time of the folders. How to extract: Download the ZIP package and extract to a folder of your choice. Launch FolderTimeUpdate.exe. Increased the size of the 'Update Mode' combo-box. Useful tool for updating folder dates according to the dates of the files within them. Extremely fast processing, making it especially useful for multilevel directories with a large number of folders.